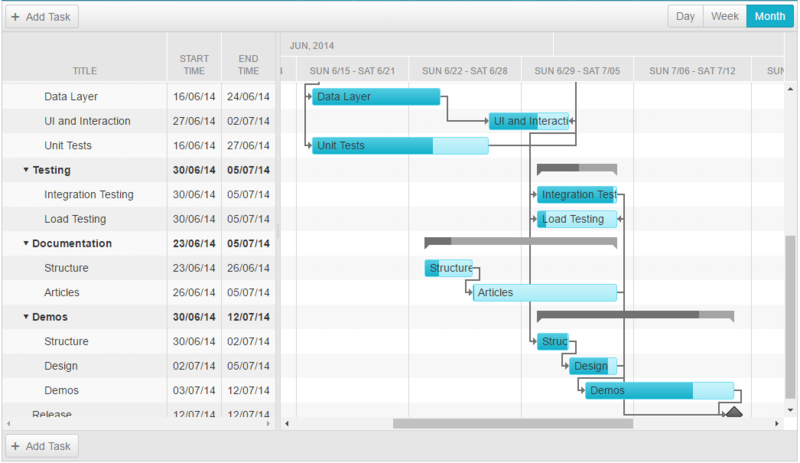 The Month View shows all loaded tasks for a RadGantt, distributed in columns, that have duration of one week. Months are displayed as super-headers of those columns. Table 1 demonstrates the properties that are available within the MonthViewSettings object. MonthHeaderDateFormat string Gets or sets the month header date format string in MonthView. RangeEnd DateTime? Gets or sets the end date and time of the visible range on the MonthView. The RangeEnd date will not be included within the visible range. RangeStart DateTime? Gets or sets the start date and time of the visible range on the MonthView. SelectedDate DateTime? Gets or sets the date and time to which the timeline of the MonthView is scrolled. SlotWidth Unit Gets or sets the slot width in pixels for the MonthView. Type Telerik.Web.UI.GanttViewType enumeration Gets the type of the View. In this case a MonthView. UserSelectable bool Gets or sets a value indicating whether to render a tab for the MonthView in the view chooser. WeekHeaderDateFormat string Gets or sets the week header date format string in MonthView.